Not sure if you guys have already seen this or not -- this is the pitch I wrote up for the 2010 movie, which never made it as far as review by the story team (so it is NOT official). Seeing this, Ackar flips out. His eyes glow, his voice as he shouts “Ackar!” takes on a weird echo effect – and suddenly the rock the Skrall was hiding behind becomes animate and grabs the Skrall, starting to squeeze. Ackar gets up at this point, looks from Mata Nui to the Skall and back, and says, “Hold it!” Startled, Mata Nui returns to normal, the rock goes back to being a rock, and the Skrall drops to the ground. Mata Nui asks the Skrall what his name is. The Skrall replies he has no name … he is just a Skrall warrior. Complaining that he can’t just call the Skrall “Hey, you!” the whole way, Ackar gives him a name. (This should be something along the lines of “bucket head,” insulting but not vicious and amusing enough that kids will laugh at it.) The Skrall assures him he will carry the name with honor. That's all I can say about the ending. so, we could have gotten Skrall Armor Ackar, kiina and mata nui sets? There would not have been any official concept art for it, since the story team never got a chance to look at this. There might have been fan art. I've discussed the concepts before online, but couldn't recall if I ever shared the actual document. This would've been a pretty good movie. Shame it got cancelled, really. I remember reading this before on your old BZPower blog. Nice to have it posted in another location, though. The first was written up way back in 2009, and involved a fair amount of digging to find again, so this topic should be slightly easier to get to. Thanks, Greg! Could we have gotten EL sets? Nice! Yeah, I technically had seen this before, but it was something like 5 years ago (or more) on BZPower, well in advance of the date that I signed up as a member. Thank you for posting this; not sure if we could get it pinned by a fellow who =has the authority to do that. The extent to which G1 could have continued on Bara Magna has always fascinated me; I've felt for quite some time that the 2009 arc stands as the greatest well of unfulfilled potential in Bionicle's hostory; more than Mahri Nui, more than the entirety of G2. As it were, I loved Legends of Bara Magna and am certainly glad to see this once again. You did indeed post this on BZP, but good to have somewhere else. I had hopes to do a lot with the GBs if the story continued. It was a big part of the original story that had been unexplored, and since there was nothing on them in the original story bibles, we were free to go whatever direction we wanted. I think what would have probably happened is Velika's plan would have failed, the GBs would have left Spherus Magna somehow, and the Agori and Matoran would have been left to build a society of their own. Of course, there would have been all sorts of half-finished GB experiments laying around that would have caused problems later and probably some twists about their true role in things. Oh my gosh what a massive influx of potential story content. Awesome stuff. 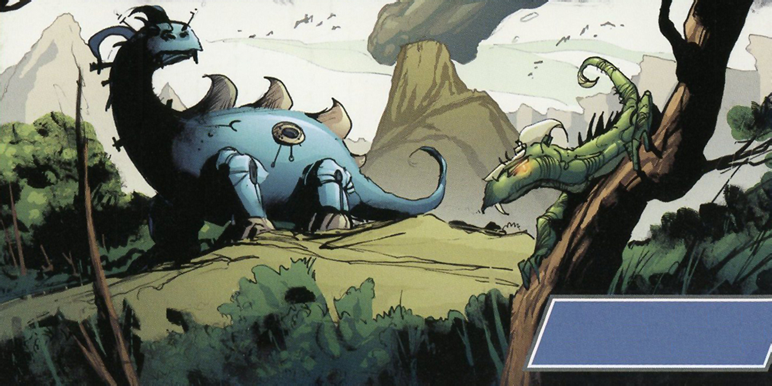 A dinosaur were shown once in a comic panel, depicting Bota Magna. I can't remember which comic this is from though. It's from Legends of Bara Magna, that final anthology graphic novel that Papercutz put out. All Our Sins Remembered, if my memory is up to snuff. Loved that one. I don't know if you've answered this before, but do you think it's at all possible that, at some point in the future when you have more free time, we'll see some creative writing from you on where you would've taken the story? Or any new story content from you? Hi - I cannot write anything for BIONICLE without permission from LEGO Company, and somebody there would have to approve it. Since the line is inactive, I can't see them wanting to devote the resources to do approvals. Uh, I don't know if you noticed, but we already got the answer for what was with the giant limbs in The Legend Reborn. It's the robot used by Mata Nui to fight the Teridax-controlled Matoran Universe in the 2010 story. If you haven't, I'd recommend you go look up something called the "Mata Nui Saga," which covers the main story of 2010.